Here’s a nifty set of print awareness strips with animal words you can pass out to your kids individually or on a ring. 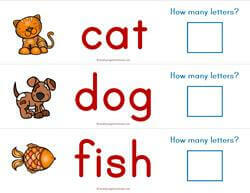 Kids read the words (if they can read yet – if they can’t the picture is there to help them) and then count how many letters are in the word. They use a dry erase marker to write how many in the box. Of course, when they’re all done they get the job of wiping all their numbers off! Please print these on card stock and laminate so they last longer.